Super discreet for beginners & travellers! Hello, hello! How are you today? I’ve been tapping up some words and taking plenty o’ photos (now the sun has started to shine and the lighting isn’t DIABOLICAL all the time) and it’s time for another review. The Wellon Tech Ripple review to be exact. I was sent [#gifted] two Ripple kits from the lovely folk at Wellon Tech (or Wellon Technology … I think), and I’ve been using one of them regularly for the last few weeks. The other one is sealed and waiting for someone to win it in a giveaway. Anyway, the review has taken me an age because I kept waiting for the pod/coil to start tasting burnt and it literally took forever. The damn thing lasts for ages. I’ll talk about that in a minute. Also: I make it sound like a bad thing and it really isn’t a bad thing at all! Wellon Technology is a Chinese brand, from Shenzhen, which is a name I read/see a lot in the vape world. I’d never heard of the brand itself, though. 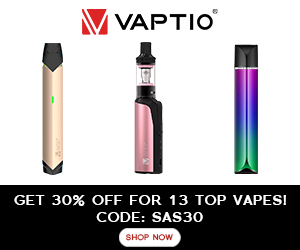 There are a few different products on the website, ranging from pod systems (the Ripple), vape starter kits, sub ohm tanks and mouth-to-lung tanks, and box mods, but I think they’re still a pretty new company. The tank contains a 1.4-ohm oil-absorbing ceramic coil, also magnetically attached to the rest of the Ripple system. A 650mAh battery completes the package, and what a dainty package it is too — just 8cm long. It looks like a USB stick. Don’t argue with me on this; the Ripple absolutely looks like a USB stick. I actually thought that’s what it was when it first turned up and wasn’t entirely sure why someone would have sent me such a thing. I genuinely thought I might be the victim of some weird blackmail scheme for a moment. Initial confusion out the way, I opened the packaging and realised that it wasn’t a part of some blackmail attempt (I love to be dramatic; I’m a writer), but actually a new little pod vaping device — Ripple by Wellon Technology. It’s tiny and super discreet. I’d use it if I were travelling around, taking hasty vape-breaks in between bus or train stops or whatever. I don’t really like the black one, although the aesthetics aren’t overly important. I received a silver one and a black one and I actually regret opening the black one. The other three metallic shades — silver, rose gold, and champagne — look more like a vape and less like a USB stick. That’s my opinion, anyway. Luckily, one of you lovely lot will bag the silver one. Just keep scrollin’, just keep scrollin’. I’m not sure what this whole “Just one kiss & enjoy a great vape” crap is, that they’ve got on the website. I ain’t kissin’ my vapes. Nor do I want to. It’s unnecessary marketing drivel. Let’s just take a moment to talk about that skin-sensing technology for just a moment though. The only time I’ve ever used a skin-sensing vape before was the Lady Q Artery … which was pants. When I read that the Ripple also featured a non-button, touch approach, I groaned a bit. I wasn’t expecting good things at all. You’ll be chuffed to know that I was wrong to judge the Ripple too soon, though; and those skin-sensing panels. Well … kinda. The skin-sensing panels are actually pretty nifty and they work well. There is one tiny silver panel on each side of the mouthpiece, and you MUST make contact with both sides for the device to fire up. It DOES go off when you touch both silver panels with your fingers; but it’s never fired up in my pocket, handbag, or even in my hand. You need to hold or position it pretty deliberately for it to start working, and that really works in its favour. You shouldn’t have too many vaping-in-pocket scenarios. The mouthpiece is quite small and dinky. I don’t think I liked it that much, but I prefer that my sub-ohm mouthpieces are wider than my mouth-to-lung ones. That might be a bit odd, but that’s just how I work. I was quite satisfied when I used the Ripple as an MTL device, but sub-ohm vaping with it didn’t quite yield the same level of satisfaction. I did like the fact that you can use both mouth-to-lung and sub-ohm juice in the pod, as well as vaping with it in both mouth-to-lung and sub-ohm styles. The coil is a 1.4-ohm coil, and I assumed that it would be for more MTL juice, but when I asked them about it they told me to try both ways – they gave me a spare pod so that I could. I used a Black Note tobacco MTL eliquid in one pod (50/50 VP/PG). In the other, I added some of BEAR Flavor’s Panda – an 80/20 VG/PG juice for sub-ohm vaping. Both pods performed pretty well; although I did prefer MTL over sub-ohm. The MTL way, on the other hand, was actually pretty decent. Probably not quite decent enough for me to make this my everyday vape; but for travelling or when I need something discreet and handbag-sized, the Ripple would come in pretty handy. It’s unassuming, can easily be hidden in your hand (even mine – they’re tiny! ), and gives you not-bad throat hit without lots of vapour. Perfect for when you want to vape on the down-low. Not so perfect if you want something obvious and cloud-chucking. Again, I found the type of juice and style of vaping had a big part to play in how great the flavour production was from Wellon Tech’s Ripple. Mouth-to-lung vaping (and 50/50 juice) seemed to give me a slightly better flavour than sub-ohm vaping with sub-ohm, high-VG juice. I just don’t think it’s quite powerful enough to deal with the high-VG stuff. The flavour wasn’t bad, but I just felt it could have been better. Sub-ohm vaping = 2.5 stars out of 5 for flavour. Mouth-to-lung vaping = 3.5 stars out of 5 for flavour. I really liked the way that the 2ml pods were magnetically drawn into the chamber, but it didn’t always slot into exactly the right place every time. Sometimes, I had to jiggle it a bit first. I don’t think there is a way of changing the coils in the pods. From what I can tell you just need to replace the entire pod. Okay, so the window isn’t actually so secret, but I do love that Johnny Depp movie, don’t you? You can see the pod through a window on the side of the Ripple, and this allows you to keep track of how much juice is left inside it. Similar to the Aspire Gusto Mini, there is no cover to this window and the edges are very edgy. Y’know … a bit sharp. The Gusto Mini rough edges scratched my skin more than the Ripple does, however. I’m actually pretty astonished by how long the pods have lasted me. I’ve had the device for a while now … 4/6 weeks or so? The sub-ohm one has definitely started to taste a bit not-fresh, but the mouth-to-lung one is still going strong … And that’s the one I’ve used the most too. I don’t use the Ripple all the time. I don’t think it’s powerful enough or with enough battery capacity to deal with that, but I do find myself picking it up when I’m going out. It’s awesome that it fits in my pocket and not a super obvious, cloud-chucking vaporizer. Sometimes, I just don’t want that, you know? However, I have used this device fairly regularly since I got it. If I were to put all the days together, I reckon that I’ve had a good three or four weeks — maybe more — of all-together vaping time. Saying that; the coils/pods might not have lasted quite so long if I had used them continually, I don’t know? Anyway, the pod lasted me for a lot longer than anticipated. No burning taste. No weird gunkiness. Just easy-breezy vaping. I don’t even think I’ve noticed a reduction in flavour yet, either. That’s impressive, right? I didn’t like that the Ripple wasn’t entirely stable when you stood it up. The slightest knock would send it over onto its side, and what happens when a vape tank is left on its side for a while? It leaks. The Ripple didn’t leak, as such, but it when I pulled the pod from the chamber of the device after it had been left on its side for a while, the outside of the pod was a bit … slimy. None of the juice had actually come out of the device onto anything – my hands, inside my pockets, etc., but there was definitely a film of liquid over the pod. Therefore, I dislike that the Ripple doesn’t stand up properly and spends lots of time on its side. As a sub-ohm device with sub-ohm juice, the battery lasts for a couple of hours max. As a mouth-to-lung device, with 50/50 (or thereabouts) eliquid, I got around five hours or steady (ish) use out of it. By steady, I mean: working a full day at the laptop, chain-puffing for 10/15 minutes, every hour or so. It’s got a 650mAh battery, which is pretty small in the grand scheme of things. You would need at least two pods to “safely” see you through a full day – one on charge; the other on the go. That’s if you’re planning on using it MTL-style, too. I wouldn’t recommend the Ripple for anything other than occasional sub-ohm use. Now let’s flip things around! I loved how small and discreet the device was, and how easy it was to use too. That whole plug-and-play thing is great for new vapers, or for those who want something easy/quick to use on-the-go. I think you kinda know what you’re going to get when you buy the Ripple. It’s definitely not going to offer up the same kind of vape experience that a much larger and more powerful box mod could. Although it’s made out of thin plastic, it’s actually not as flimsy as it looks. This was something else that I was pleasantly surprised by. The cased-in, pod-style means that you have no chance of smashing the pod itself unless it’s not in the Ripple chamber at the time. I’ve smashed my fair share of glass vape tanks, so I appreciate these closed-in styles so much. Anyway, bashed right against the wall and absolutely nothing happened. I half-expected it to be in lots of little pieces when I rushed over to check it, but it was in one-piece, still in full working order, and didn’t even appear to show a chip or crack. That’s impressive for something made out of little bits of plastic, right? I know that I’ve listed a few negatives above, but this vape has likeability. Odd, I know, but it’s cute and it works. It might not be as powerful as other devices, but you know that when you’re buying it. If you’re getting something as small and compact as the Ripple, you know it’s not going to be a big powerhouse, right? If you’re under no illusions that this is something it isn’t, I think you’ll be pleasantly surprised by it. Would I buy the Wellon Tech Ripple again? I wouldn’t use this as an all-day, everyday vape, but I would take it with me on journeys. I HAVE taken it with me on journeys. It’s discreet enough that I can get away with vaping it almost anywhere. (I’m *totally* talking about legal places only.) It doesn’t give off huge plumes of vapour, meaning that you won’t draw attention to yourself, but it does still give you some pretty decent MTL satisfaction. Plus, the pods/coils seem to last for a long time, especially with lower-VG juice. Would I recommend the Wellon Tech Ripple to you? If you’re looking for a hearty sub-ohm vape, this one isn’t going to tick the right boxes for you. Although it does work as one, I think it performs much better using it in an MTL way, with MTL 50/50 (approx) VG/PG eliquid. If you want something that’ll see you through long car journeys or family events with relatives who give you serious side-eye every time you puff on high-VG Jamnation juice, on the other hand, this one is fab. I also think it would be great for newbie vapers. It’s definitely easy to use. It’s not perfect, but if you see it for what it is — a handy little vape — it definitely performed better than I expected. Check out Wellon Tech for yourself here & find more information about the Ripple here. *Prices & other information correct at time of writing. HONESTY POLICY: These Ripple pod vape devices were sent to me by Wellon Technology for a review + competition giveaway. I did not pay for these products. I wasn’t paid for this review & I will not be paid for any of my HONEST reviews. All opinions are mine and in no way influenced by the brand or manufacturer. Next: Eliquid: What Does Short Fill Mean?